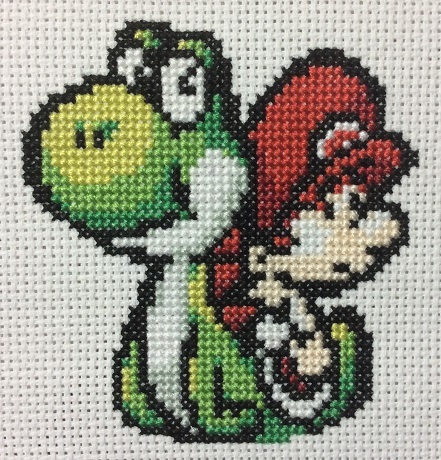 Next up in my Sprite Stitch stitch-a-long is Yoshi’s Island. This one is yet another blackberrybear creation. She and I clearly have the same taste in games since I’ll be stitching a few more of her creations before my stitch-a-long project is over! The original pattern (which you can find over on Sprite Stitch) used pastel colours, but I changed them to match the image on the front of the Yoshi’s Island DS game, since it’s the only one I’ve played. To be honest, I only played a bit of this game. I didn’t dislike it, I just get easily distracted by new games so games often don’t hold my attention for very long unless they are truly exceptional. I simply thought that baby Mario was too cute not to stitch and the character shot makes for a nice contrast to the many squares that use a more traditional, multiple-motif, sampler style. Next up is a seriously fantastic Minesweeper square, so be on the lookout.